PATIENCE is the Key to SUCCESS. A Lack of Either is "Failure in this Hobby". That wrasse is a show piece! Thanks. He is special since very bright red (even with his tiny size). Wish he would come out more. He hides in QT too much since I gave him too many hiding places to feel safe. Hoping when he goes into DT he shows up more. He will be the only Wrasse so should get along with established fish. Hey Wally, love the scape! Hey Wally, the corraline is definitely happy in there. I don’t see a lot of fish in the pics. How many fish in there? Yeah, it's funny how the Fish All Hide during photo time. 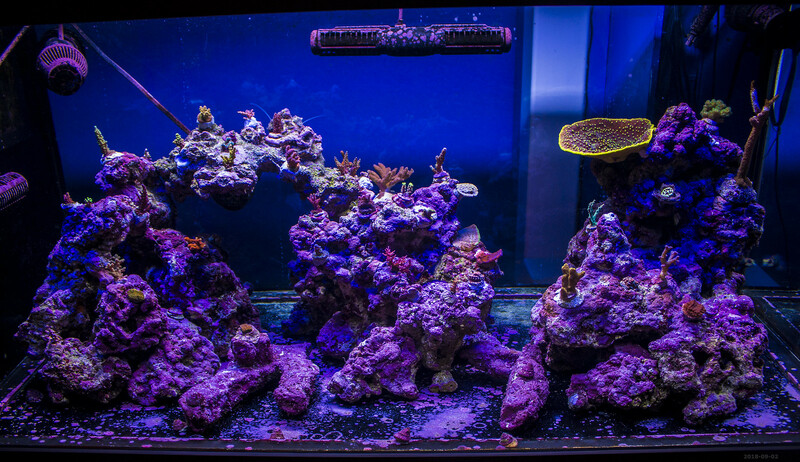 and I pick the No-fish Photo to show Frags. I have been adding fish over the last while with the new tank, but lost one Large Tomini Tang. Got 7 fish in this photo to give you an idea. They eat like crazy. I'm doing 3-4 cubes of Frozen a day, with Flake and pellets in between. I don't plan on adding much more fish, except some small Gobies, to fill in he nooks and crannies (later, if ever). Last edited by Wally.B; 09/05/2018 at 12:39 PM. 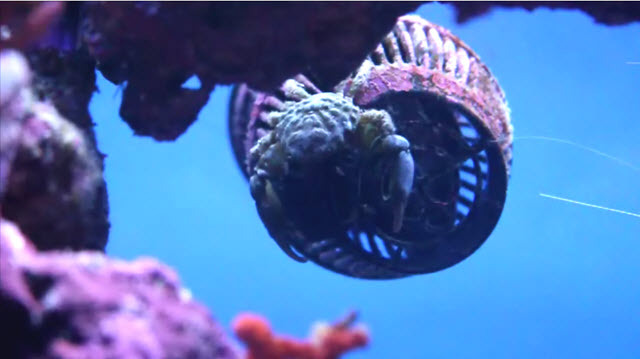 Two emerald Crabs is too much for this Depleted Algae Tank. After seeing him do this I caught him (bigger One) and put him into Other Tank with Pataches of Algae and Also Valonoia Bubble Alage. I should add a few to my tank, see if they help with the bubble algea. So you do have a decent bunch of fish. Good. Sunburst is one of my favorite fish, although I’ve never been very successful at keeping them. Also love the blackcap- another I’ve never really kept! Yes, he is quite spectacular Looking and really stands out in the Tank. BUT I WOULD LIKE TO HEAR "Why you had Problems Keeping Them"? I am kind of worried about him. Store has a Pair, but I only took one. Then I read they do better in pairs, but store sold the other. he was like breathing in Whole Cubes of Frozen Spirulina Brine Shrimp in one gulp. So I had High Confidence is his readiness for DT. I didn't pay attention to his Eatting In DT. But recently it caught my Attention that he does chase food with Enthusiasm, but doesn't eat much. Rakie has one and said they are picky eatters. I've been trying all kind of things to get him to eat more vigorously. (Food Variety). Maybe he is eating something else, or filter feeding. No idea. He is as Plump and Thick as a Fish his size can get. Not terribly worried, but concerned since I like him. Very Peaceful, shy to other fish, but out all the time. How long do you quarantine? Any meds in there, or is it for observation? However I will share my experiences and recent practices. #2) After that WIPE OUT experience (big lesson learn) and this new Tank I swore I would QT all my fish. I did exactly that, and have Zero regrets since so far so good, all my DT fish are doing well. I did lose a few fish in QT during the process. QT not DT to be clear. Each QT TANK iteration I did started with a Seachem (AMMONIA ALERT) To to Warn me about High Ammonia Levels, and that helped me catch an Amonia Spike (that surely saved one of my QT fish doing a quick Water Change to bring down levels). I also ran the QT's using a hang on Filter with Seachem Matrix Media, and used Seachem Stability to quickly establish Bio-Filter[/B]. #3) I did a variety of QT methods that depended on the fish and symptoms observed. 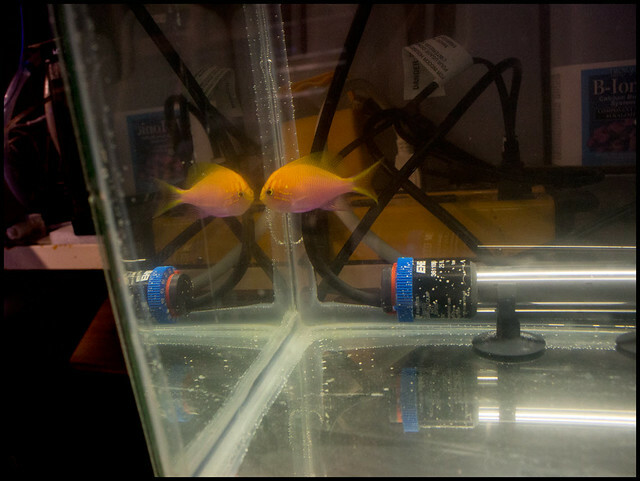 3a) I Did CopperSafe (gentler than Curpramine) and ATI Furan-2 when I had a school of Anthias and some started Dying. I managed to save 2 Fish and they are in my Tank now dong very well. 3b) One QT I pre-treated the fish with PRAZIPro for possible parasites. (didn't see any symptoms, just did it since fish type was susceptible to them). 3c) When My Copperband got ICH I did the Tank Transfer Method (No Meds), and it worked perfectly to get rid of his ich. I no longer FEAR ICH (in QT) anymore, since I 100% trust TTM works if done properly. 3d) and for the healthy looking, and good eating fish I used KENT ZOE Vitamins to treat the Frozen Food and used it in my Masstick Food Mix) to boost their Immune system. 4) Finally when I felt it's time to Transfer the fish from QT to DT, I would do a 3 stage acclimatization. Catch Fish in container with QT Water. MATCH container TEMP to DT Temp. Empty half way, and fill with DT water then Wait 5 minutes. Repeat 3 Times. (I prefer this method over Dripping method since it CAN be more risky when Carbon Dioxide mixes into Water with Ammonia creating a toxic solution). Long term Dripping can be better for sensitive Specimens if done properly. One last word....have a good covered QT, since I actually lost 3-4 fish from Jumping out, which is more than I lost to diseases (for this new Tank Setup). Last edited by Wally.B; 09/09/2018 at 08:44 AM. Thank you for the in depth reply. I know there is no "one" answer, and that quarantine method, among a few other topics, are very debated. My big tank has just finished up cycling, and I am planning on adding some fish soon. 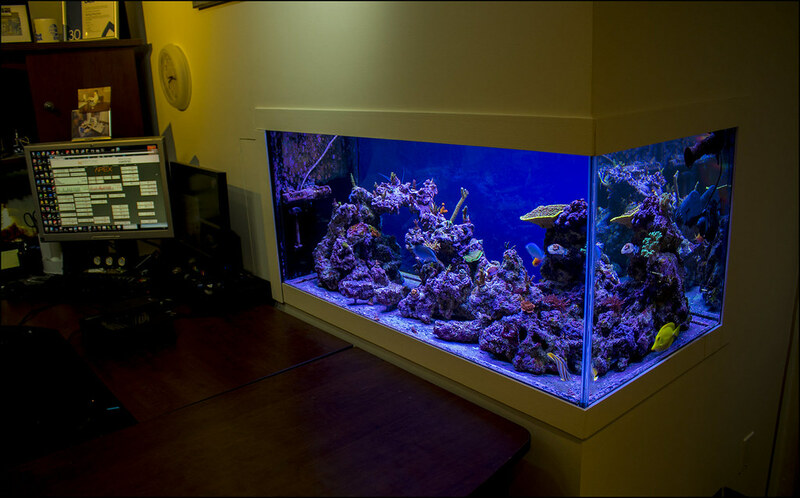 I have a spare 40g setup that I am planning on using in a similar manner- keep it running as a QT, clean it out in between batches of fish, use some copper based medication. 40 Gal QT is perfect. I used 10G's and 35 G. The 10 Gals were great for Tank Transfer Method, but for longer term the 35 Gal was better since it didn't get as polluted so quickly when trying to train fish with food they don't exactly eat right all the time. One thing to note and I'm not sure this is true. 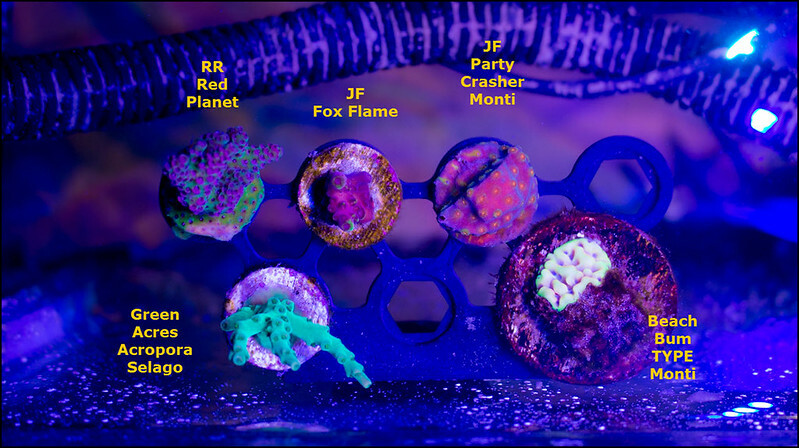 I was told once you use Certain Coppers in a Tank it get's into the Silicone and then it's contaminated for future use for Corals. (I am not sure this is true with Curpramine/CopperSafe). AND BEST OF LUCK with your new Tank and NEW FISH. Luck is part of the NEW FISH GAME....Big Part. (To improve your luck/chances. Inspect fish in the Store well. Come a few times. And ask that they feed the tank to see if your choice fish eats. I'd would always take a Eating Fish over a Bigger fish, and actually shy away from a Fish I don't see eating in the store. Too stressful to Try and get a Fish Eatting in QT). Last edited by Wally.B; 09/09/2018 at 09:23 AM. Since I’ve always just added fish to my display without qt, I never get to observe if a fish is already eating well before getting added to the chaos of the display. I can’treallt say why I’ve had trouble but I always found them very timid and not big eaters.. I assume they just didn’t keep up with the rest of the fish. It’s been many years since I tried any.. Perfect Matt, your observation of past matches my current observation. The Sunburst Fathead Anthias fish, although big an hearty looking is very timid (but was quite the eater when Alone and not intimidated by other Fish in QT). His behavior is "Sorry.....Am I in your way? You Eat First please..." to all fish. Just like the Corals the Fish will mature/grow. Snapped a photo of each for future reference. 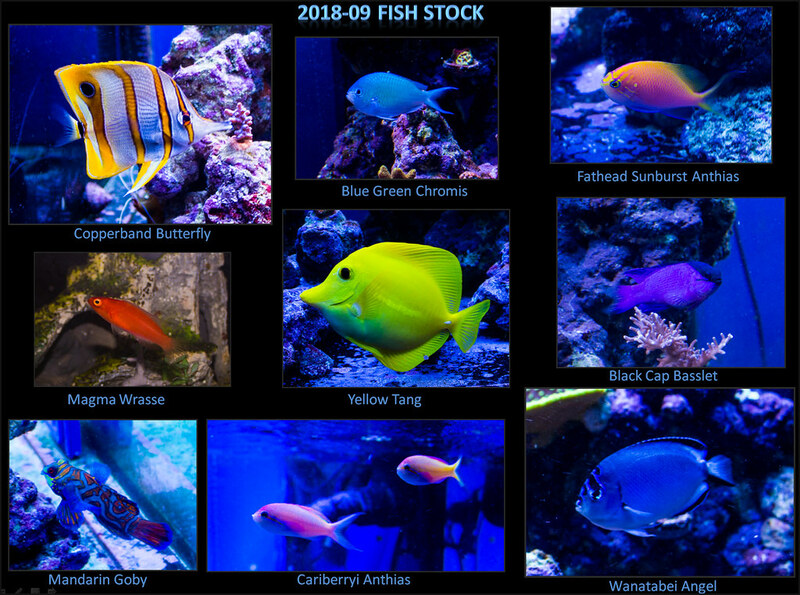 Interesting to see the Cariberryi Anthias changing slowly with features and more Color. 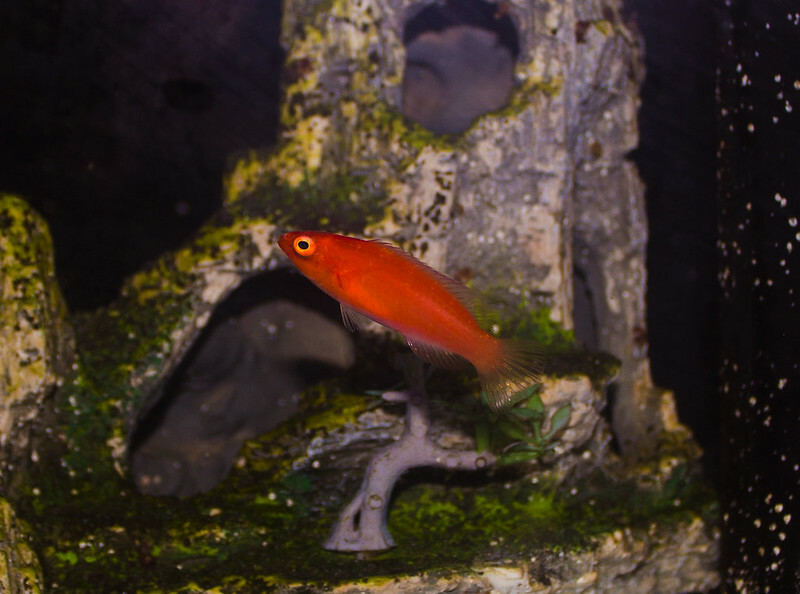 And looking forward to what the Juvenille Magma Wrasse will end up looking like Mature. A few examples. Nothing super special, but anything is better than that past Tank Setup. Good encrusting. 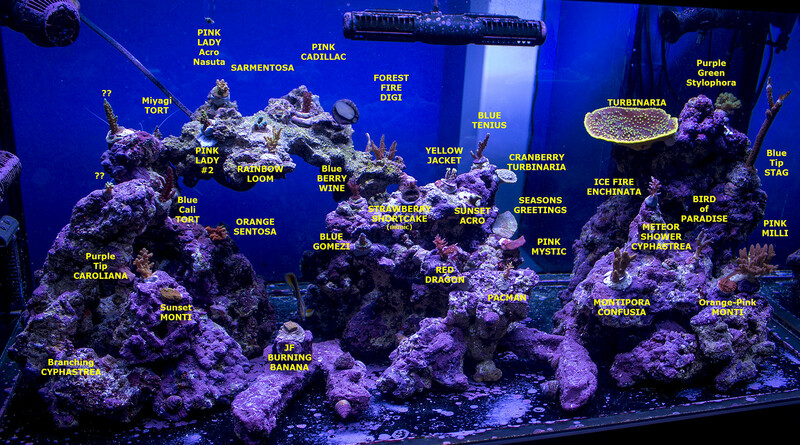 Corals look happy. That last pic shows a bit of grow in the body of the acro as well. I killed each one, after 3-4 separate tries. I actually couldn't Keep anything Colored Blue in that Old Soapy Tank. This time things are quite Different. Blues are getting better after Frag Placement. I see it’s encrusted a bit over the months. I have a couple pieces and they grow extremely slowly for me. Unlike Bulent’s gomezi which grows like a monster.. I wish mine free a bit faster. Yours is looking nice and health though. I must look into what a Bulent Gomezi is. So Blue's don't appear to be my problem, or REDS, Orange, or Greens. But YELLOW's are (in a couple of cases). They (YELLOW) turned (Green), and from what I read it's common. Is it true to Keep Yellows, you need Lower N & P. But I'll live with No-Yellow Colors if I have to sacrifice Blues/Red Colors. Also on a TOPIC FROM THE PAST. Vermitid WORM. Just yesterday I finally figured out why my Red Dragon was really Getting Irritated. After taking close up photos, I notice the Typical Vermitid Cob-web in that area. And a even closer photo of ROCK FOUND THIS growing on in. I removed the Rock, carved out the Mound. NO more WEB. Last edited by Wally.B; 09/30/2018 at 10:54 PM. You really don’t want those worms getting a foothold in an sps tank.. they are a real nuisance and can reproduce quickly sometimes. You were smart to get it out. Bulent is Discusheckel on RC. His thread is amazing and you’ll find it in the sps forum. Probably on the first page. Well worth the read. His gomezi is stunning and grows like a weed. He is from the UK..
As for yellow, it’s certainly the most illusive color in coral. 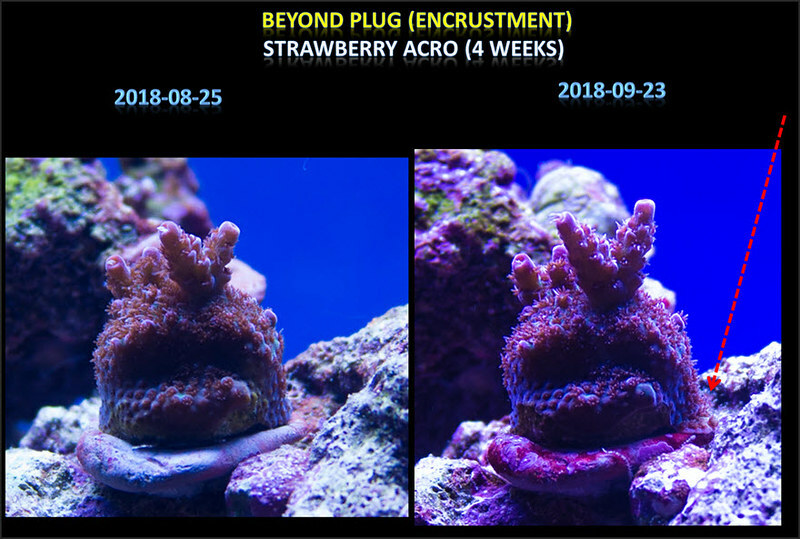 Yes low nutrients are somewhat important as are blue leds.. the blue LEDs in the radions make many a green coral look yellow. 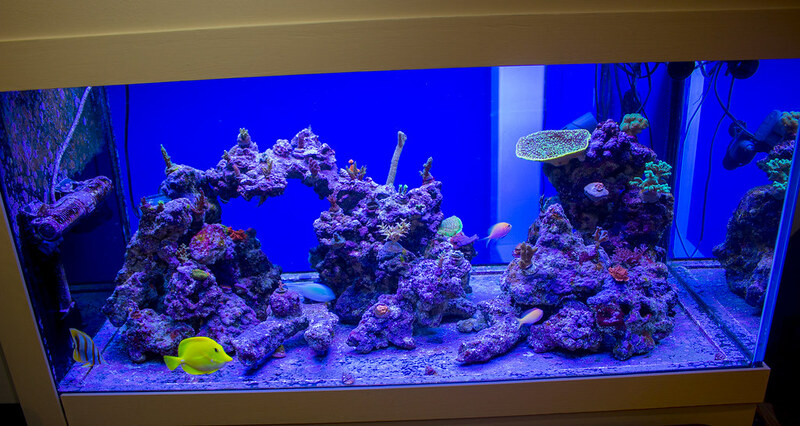 You will never see as many yellow and bright orange corals as you will in a tank under those lights. 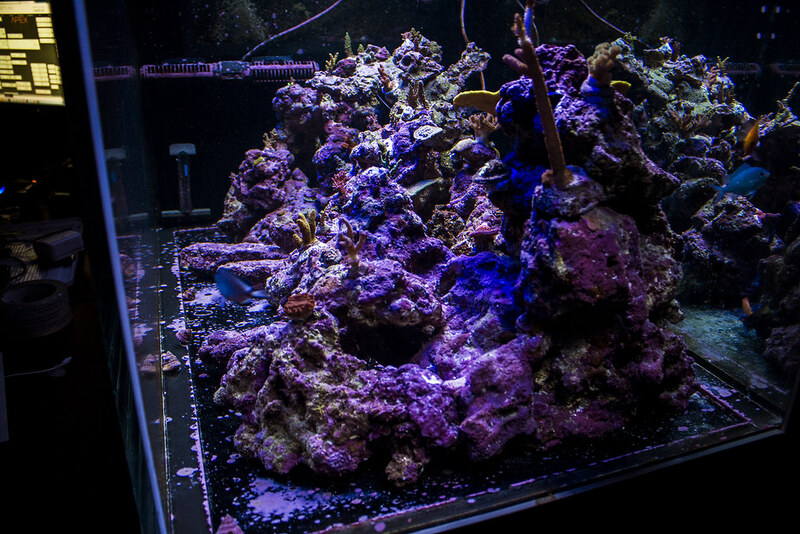 It’s just the led combo in those lights that make the corals fluoresce that way. 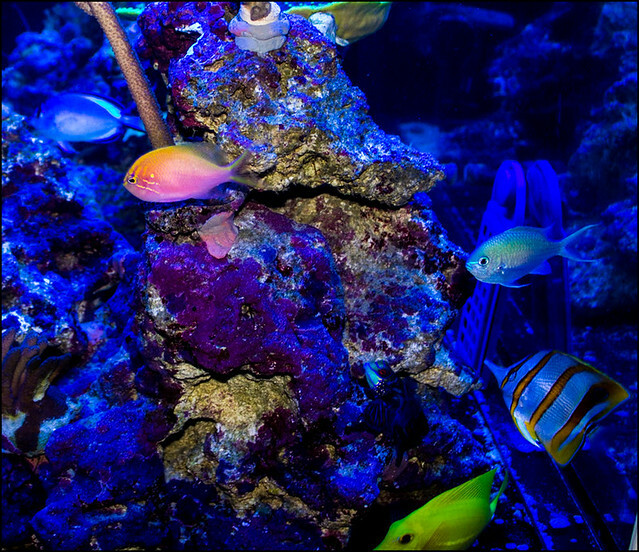 Under most other types of light, they don’t look quite the same..
Reefbrites are pretty good at bringing out that color as well.. my AI Primes can do it a bit but not like the radions. I have tried more RR wolverines and pickachus and Pink Floyd than I care to admit and I have lost them all. The single yellow coral I have is a frag I got from fragbox several years ago called habanero. 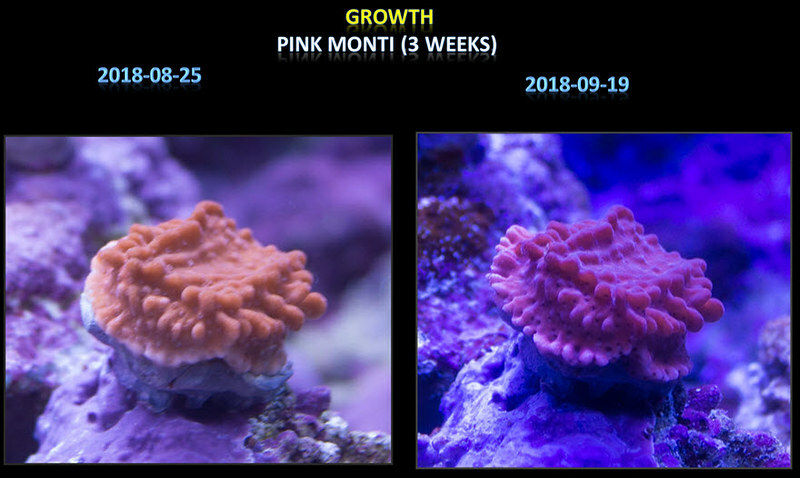 Looks like a Pink Floyd without the red polyps..
Anyways, keep watching the paint dry, Wally, you will be rewarded eventually! Nothing is doing bad. NOTHING!! It's been a while. Just watching Frags growing SLOWLY. Been working on bringing P down. Getting close to Stable 0.1ppm. Give up on Nitrates. Stuck Stable at N=20-25, no matter what I do. Fish Happy.....Frags are Happy. 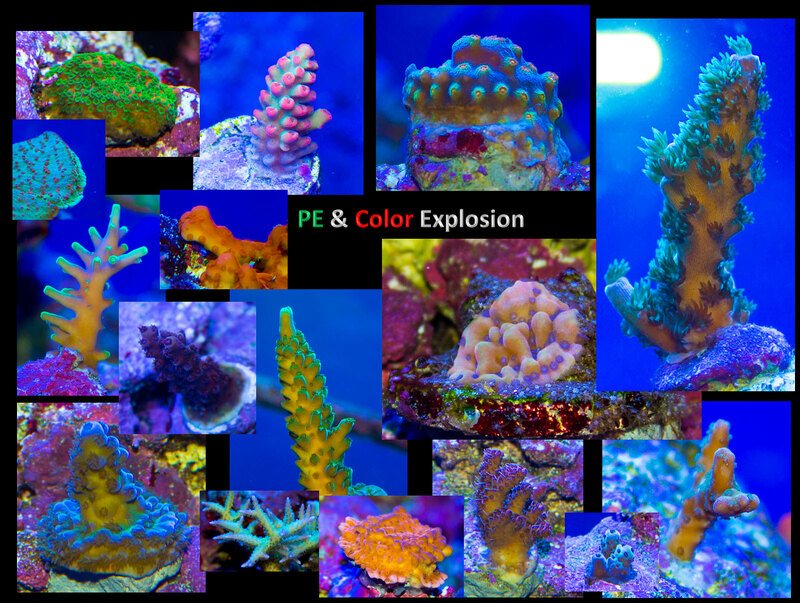 Little low on PE for a few, but Colors are good, and grow appropriate.